The name of this recipe and post are a little bit misleading- though we love hanger steak, you really don’t have to have it to make this recipe good. You can season any cut of beef (sirloin, ribeye, flank steak, etc.) as we suggest you do in the recipe, and with the addition of the chimichurri sauce, it’ll be delicious. We would suggest sticking with a more flavorful, higher-fat cuts of beef to stand up to the strong flavors in the seasoning and the sauce. This is one recipe where beef tenderloin may not be your best bet- as tender as it is, the subtle flavors of the beef could get overpowered here. 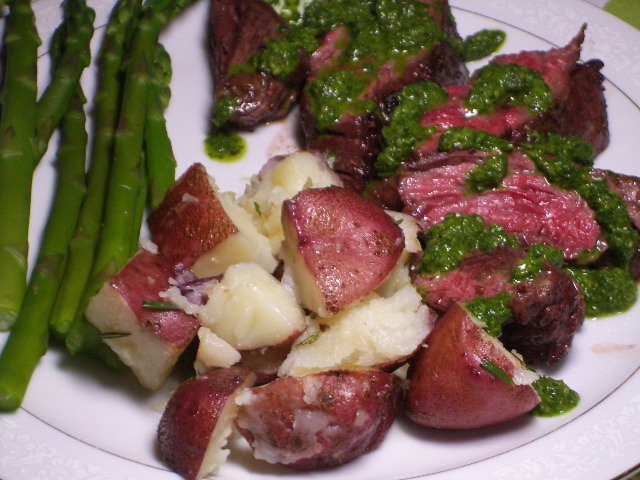 We first discovered chimichurri sauce when we were enjoying a tasting dinner to prepare for our rehearsal dinner (one of the most fun evenings ever, by the way!). Out of the many courses we tasted that night, the steak with chimichurri sauce came away as the winner. Some folks only use parsley as the base, but when we first had it, there was cilantro too, so we include that in our recipe. We love cilantro (as you can see from Tuesday’s post and many recipes before then, too), but not everyone does. There was a New York Times article that recently talked about how the taste for cilantro is genetic- some people have the gene to love it, others don’t. So, if you don’t like it, it’s not your fault. But! We presented this dish to an admitted Cilantro hater this past weekend. John and Rebecca came to visit, and we had a great time, and John bravely asked for the chimichurri on the side at dinner given his dislike for cilantro. Turns out he loved the sauce- he even asked for more to finish off his steak! So, don’t let previous bad experiences with cilantro deter you from trying this chimichurri sauce- it’s really not over-the-top cilantro so much as it is just delicious. We have been blog slackers and JUST now saw this… LOVE it. (And LOVED the chimichurri, for other blog-readers.) Definitely saving this one for the recipe file! Miss you guys – come visit us in DC anytime!